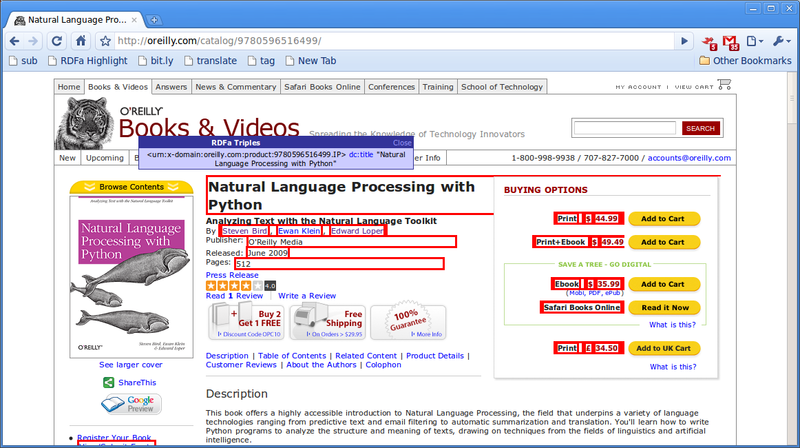 <urn:x-domain:oreilly.com:product:9780596516499.IP> dc:title "Natural Language Processing with Python"
frbr:embodiment <urn:x-domain:oreilly.com:product:9780596516499.BOOK>, <urn:x-domain:oreilly.com:product:9780596803346.SAF>, <urn:x-domain:oreilly.com:product:9780596803391.EBOOK> . I was curious so I wrote a little crawler (41 lines of Python+rdflib) to collect all the metadata from the O’Reilly Catalog pages. Yes all the pages! It ended up pulling down 92,101 triples. 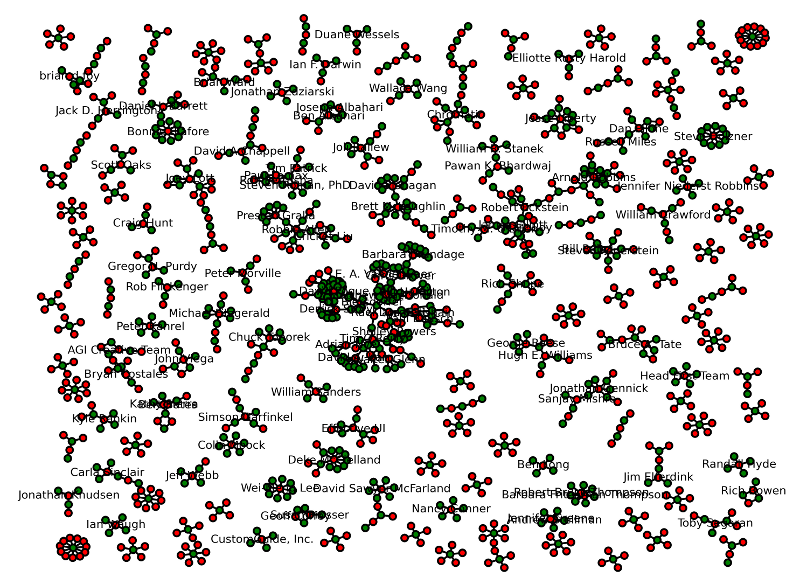 And adding a little bit of networkx judo you can get an xmas-friendly graph of authors (the green dots are books and the red ones are authors ; I limited author labels to authors who had written more than 2 books). Admittedly this is not very readable, but I imagine someone with more network visualization skillz could do something nicer in short order. There’s a lot that could be done with the data. This exercise was mainly just to demonstrate how layering some new stuff into your HTML can really open up doors for how people use your website. Clearly O’Reilly did some deep thinking about what data they had, and what vocabularies they wanted to model it with. But once they’d done that they probably just had to go add 50 lines to an HTML template somewhere, and it was published (props to David Brunton for this turn of phrase). It’s a really good sign that a tech publisher with the stature of O’Reilly is giving this method of data publishing a try. Anyhow, hats off to O’Reilly for putting RDFa into practice. I hope the rest of the publishing (and library world) take note. If you are looking to learn more about RDFa Ben Adida and Mark Birbeck’s RDFa Primer: Bridging the Human and Data Webs is a really nice intro.